Today’s assignment via the Daily Post is to write about a big risk that you’d like to take and haven’t gotten around to yet. After a little reflection, I’ve realized that my life is a study in opposites. I have no problems taking huge steps that leave others quaking in their boots, but the small steps sometimes hold me up for years. So I’m going to talk about a plan that I have, to do the coolest thing ever. I don’t know when I’ll do it, but it won’t be too long from now. And it will be glorious. When I was growing up, my mother refused to use curse words of any rank. No shits, damns, or hells crossed her lips. She wanted to teach me to be a lady. My father, on the other hand, cursed like a sailor. Guess which one I emulated most? Anyway, when Daddy would piss her off, instead of saying something crass like “screw you,” she’d tell him, “Why don’t you go take a long jump off a short pier?” I always loved that saying. The visual still makes me giggle. But this has nothing at all to do with my post. It’s just a funny story. I’ve always loved stories. I eat them up. I started reading at 4, and never looked back. I won the summer reading contest at my local library for years in a row, rolling through books that were way above my age level. By the time I hit puberty, I’d long since read every book in the young adult section of the library, and had moved on to the least racy of the adult section. Every now and then I managed to sneak something slightly naughty (say, with kissing) past my ever-watchful mother, but not often. The statue from my childhood was a bit nicer than this, and the spear went straight into the dragon’s mouth. It’s hard to pinpoint where my love of things medieval started. In fact, I don’t know if I ever actually tried to suss it out before this very moment, as I write this. My father had an alabaster statue of St. George killing the dragon. The spear would slide in and out of gallant Sir George’s hand, and I loved to play with it when I was very small, giving the dragon what-for from other angles that George couldn’t reach. Swordplay always interested me, too, as my all time favorite movie as a kid was Return of the Jedi (I wore out so many VHS tapes). As a story-eater, fantasy books ruled my world from the beginning, too. I specifically remember reading the books of The Chronicles of Prydain, then getting so terribly depressed at the end of the series that Mum, flustered, suggested I read them all over again from the beginning. After that, many of my favorite books took place in medieval-themed settings, even if the stories happened on other imaginary worlds. How could you see this cover and not HAVE to read this immediately? Then at some point in my childhood, I happened across a book that changed my life. I didn’t know it at the time, obviously, but its subject was to become an obsession of mine. It will be my leap. My leap of faith. The book is called The Ramsay Scallop, and it’s a fictional account of two young pilgrims’ journey to Santiago de Compostela to take the sins of their entire small town to be forgiven. The story follows the travelers along their path, documenting with considerable accuracy the things they would have seen and experienced on their trip. As a kid, I was excited to be taking this journey with them, and also intrigued by the idea of carrying the burden and responsibility of other people’s sins with you to be deposited elsewhere. I wanted to be that selfless. Fast forward about 10 years. As a junior in college, I had long since forgotten the title of the book I read as a kid, but not the message. All of my studies revolved around religion in art and architecture, and I focused heavily on the ways medieval people reached out to the divine. I remembered that there was a pilgrimage route to a place in Spain, and that the road was arduous. I love labyrinths, and by this time had learned that in this tumultuous time in Europe’s history, when travel often spelled out death, or at least no return, the devout could stay closer to home and walk labyrinths as a representation of taking the road to pilgrimage sites of greater importance. For the Christian pilgrim, all paths symbolized the road to Jerusalem, and all shows of devotion carried a chance at salvation. Some paths showed greater devotion, though, and for many it stood to reason that you had to put your money where your mouth was, to take the leap, move beyond the labyrinth, and follow The Way. Of course, there were also those who took the road as penance for severe crimes (like Henry II’s pilgrimage to Canterbury in penance for Thomas a Beckett’s murder), and some not of their own free will, but as ascribed punishment in lieu of execution. I’m missing lots of important points in trying to sum this up neatly in a paragraph or two, so please academics, forgive this shoddy explanation. At the time, I was taking a course on medieval Spain, and decided to study up on Santiago de Compostela. What I found renewed my passion. I read stuffy old books, some fun new books, and even dredged up a copy of The Ramsay Scallop to run through again. I started planning my pilgrimage. I would travel the Camino Frances, the most popular of the 28 routes to Santiago de Compostela, starting in France, leading pilgrims over the Pyrenees and into Spain. It would take about six weeks of walking through all kinds of weather, over a sometimes arduous terrain, but it would offer the ultimate reward. Freedom. Obviously I’m still planning. To take the pilgrim’s road to Santiago de Compostela is my greatest wish. The only thing I REALLY want to do. It’s hard to explain exactly why. It’s easier to explain why I shouldn’t. After all, I’m not Catholic. I’m not even Christian. I’m a single woman, who would be travelling on my own. I can’t even speak another language. In other words, I’m going to be walking 750 kilometers on my own, in a foreign land, with nowhere to turn if I get in trouble. If I explained it that way to my parents, they’d fear for my life, and possibly my sanity. But my heart cries out to go. What will I find? Wide open spaces? Plenty of blisters? A beautiful landscape? Sore shoulders? Enduring friendships? God? Myself? I want it all. I want to suffer. I want to be good to others, to feel the Earth beneath my feet, to eat sparingly and think endlessly. Like those long-ago pilgrims, I’m prepared to die on the Camino. I know that sounds foreign and possibly terrible to you reading this, but it’s a good thing. A beautiful thing. I don’t want this life to be over, but if it does end, I want to be wearing a clam shell. 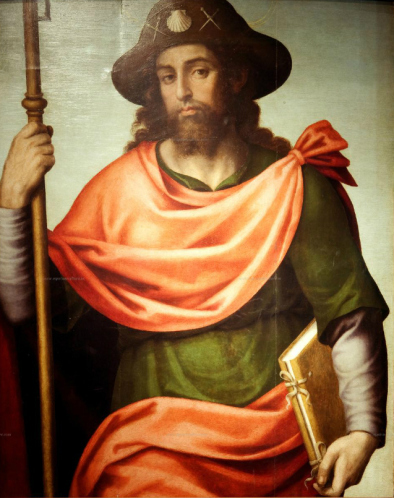 St. James the Pilgrim by Juan de Juanes. Notice the clam shell. The body of St. James is supposedly in Santiago de Compostela, and pilgrims along the Camino traditionally have worn a clam shell (or a shell-shaped patch or medallion). And the reality is that it’s quite safe. People along the route respect pilgrims, and the route I’ve chosen is actually heavily travelled. The odds that I’ll be all alone for the entire time are pretty slim, especially if I go in the high season. There’s more chance of me not getting a bed in the albergue than there is of me getting attacked. Worst case scenario, I’ll end up not meeting anyone to speak to, and spend the entire trip exploring my own thoughts and trying not to break an ankle on the trail. More probable scenario, I’ll lose 15 pounds, meet some awesome travel companions from other countries, get to see a bunch of beautiful countryside and similarly beautiful small holy sites, and end up having some great spiritual moments that make me feel at one with the Universe. What’s not to love? In Italy last summer, by a series of coincidences I happened to meet a woman who changed my life. I don’t believe in her version of the Holy Spirit, but I do believe in magick, and energy, and love. She was glowing with it. She was overflowing with it, and she was beautiful. We spent about 45 minutes talking on the bus ride from Assisi to Perugia, and I believed then and now that we were meant to meet. We still exchange emails every few weeks, and I love her like a favorite aunt. She quoted a poem to me on our bus ride that it seems to me she must have learned just because she was going to meet me one day. It makes my heart sing. you have been on the journey. your feet will carry your heart. in the sanctuary deep inside your heart. “He Is Your Peace, He Is Your Peace” carried by a South African Pilgrim and presented at Refugio Gaucelmo.